Depends. You could always trade your Pokemon over to another game before restarting, or have a friend hold them for you. This would allow you to restart your adventure all over again. But really, it's more of a personal question; if you're just bored, then why not?? But odds are, if you're thinking about restarting, you're probably going to anyways. Well that is actually the problem, I would need to find someone to hold onto the Raikou for me, because I have a Diamond version I could put it in, but no second ds, really the only pokemon of importance that I can think of is the Raikou, and maybe my Lugia, that way I could have two when I finally needed or wanted to. But I feel like restarting because I didn't get past the elite four until I trained up a team of almost purely traded pokemon, so personally I feel like I didn't try hard enough to beat the game on my own, because I used basically that same team to make my to Misty and beat her, but what I want to try and do if I restart is more or less pick any of the starters [because I feel like I'll end up replacing it somewhere later in the line] and try to catch more staple pokemon to make a team with as little as possible [so we can progress through the game and get strong as hell, then worry about training everything else after a victory against Red]. That's what I want to do. Actually, if you have wifi, I would just ask someone on this site to hold onto it for you. There's lots of trustworthy people here, so shouldn't be too difficult. But if you don't have wifi, then... Depends which one is more important to you - the shiny beast (more important than the lugia, imo), or doing the adventure right. Yeah I know, and I kinda want to get Ash's Pikachu as well, haha, want to trade? I don't really know who to ask since none of my personal friends really play Pokemon anymore. Just go to the trading forum, Pokemon Stadium. I don't have wifi, so I can't actually help you with that. I'd ask Azure or somebody well-known with a good reputation for upholding their end of the bargain. Well I've already got it all figured out and done guys, but thanks for all your help. Question is...How do I get the Lock Capsule?! Strong Pokémon. Weak Pokémon. That is only the selfish perception of people. Truly skilled trainers should try to win with their favorites. When I Try And Get One Of The Hoenn Starters Of Steven Sco Scope Wateva It Is, Hes Not There Any Reasons Why? did you beat red or go into the pokemon fan club. How do I obtain a thunder stone in Soulsilver? Thunderstones can be bought at the Pokeathlon Dome on Wednesday, Thursday and Saturday. They can also be obtained from Bill's grandfather if you show him a Pichu. Lass Dana on Route 38 gives them to you (but I think she has to call you up on the Pokegear first). It can also be obtained as a Bug-Catching Contest first prize. You can only train them up to the 100-EV limit using the Vitamins. They will not gain any stat points otherwise. In Black/White it is possible to EV train at level 100 as the game recalculates stats after each battle. I think I am going to start posting my questions in here .. I recently found my pokewalker which was lost for a while, but now it aint turning on. I have changed batteries, but it still do not work why? Is it possible to trade mystery gift-cards to another game? Is it more effective to have a Starmie rather than Staryu, even though Staryu has less weaknesses? Also, where is that juggler who trades shards for berries? For the Staryu/Starmie question, it's a matter of personal preference. Starmie learns less level-up moves after evolution, but has higher stats. It also gains a few more weaknesses, like Bug and Dark, but is then resistant to Psychic and Fighting. It can also learn more moves, I believe. So it's a matter of personal preference, but if you want a Starmie raise it as a Staryu until it knows the level-up moves you want. 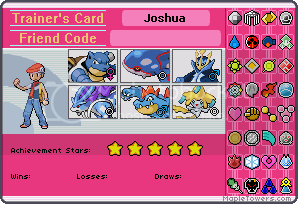 Also, you can check the Psydex for a list of stats, level-up moves, and TM/HM compatibility. There is one juggler next to the Pokemon Center in Violet City and another one somewhere in Fuchsia City.